HAWSON Jewelry: Your Best Choice for Cuff Links. HAWSON Have Nearly 10 years Design and Production Experience on Men's Fashion Jewelry Area. All Handmade Jewelry, A+ Level Electroplate Technique, Well Polished and Great Quality Controlled to Keep Long Time Color Retention. 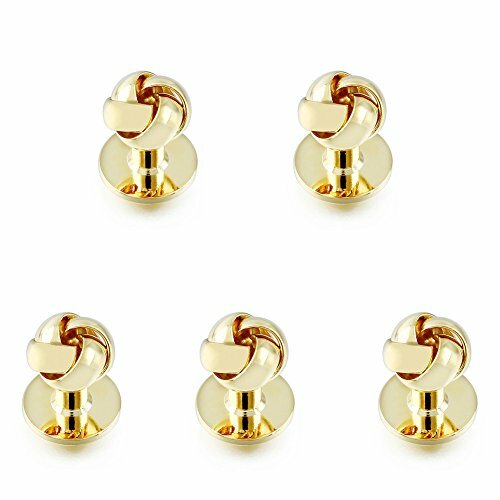 HAWSON Personalize 5PCS Flower Knot Man Shirt Tuxedo Studs and Cufflinks Set Gold. Gold Plated Base Copper Flower Knot Man Tuxedo Shirt Studs Cufflinks Set. Cuff Links:14mm,Studs:9mm,Weight:15g, Packing with A Gift Bag. Graceful Design Well Polished to Keep Color Long Time Retention. It's Suitable for Men,Easy to Wear and Won't Be Slide Out. HAWSON Jewelry, We Provide 90-Day Money Back Guarantee or Exchange If You Are Not Satisfied with Our Product. Or Contact Us If There is Any Problem. If you have any questions about this product by HAWSON, contact us by completing and submitting the form below. If you are looking for a specif part number, please include it with your message. JJ Weston Peacock Art Glass Tuxedo Cufflinks and Shirt Studs. Made in the USA.